The apartment Suite Campo consists of a living area with sofa bed and kitchen, a convenient hallway, one bedroom and bathroom. 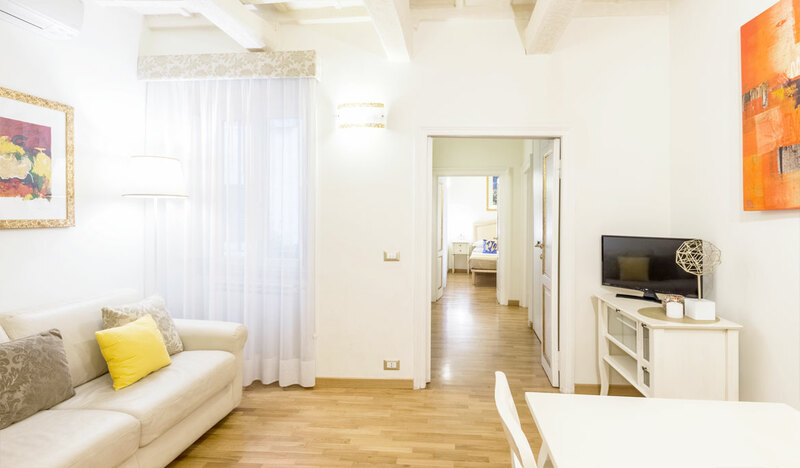 This smart combination of spaces allows the apartment to be the perfect choice for a single couple or for a family with children, or for two couples. 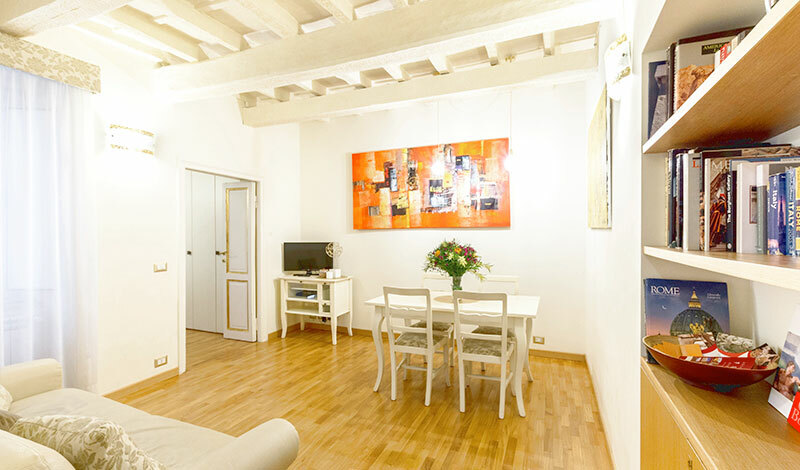 The apartment Suite Navona consists of entrance hall, lounge, kitchen, two bedrooms, a bathroom, and a balcony. Thanks to two spacious and comfortable bedrooms and a living room with a comfortable and convenient sofa bed, it can accommodate up to six people. 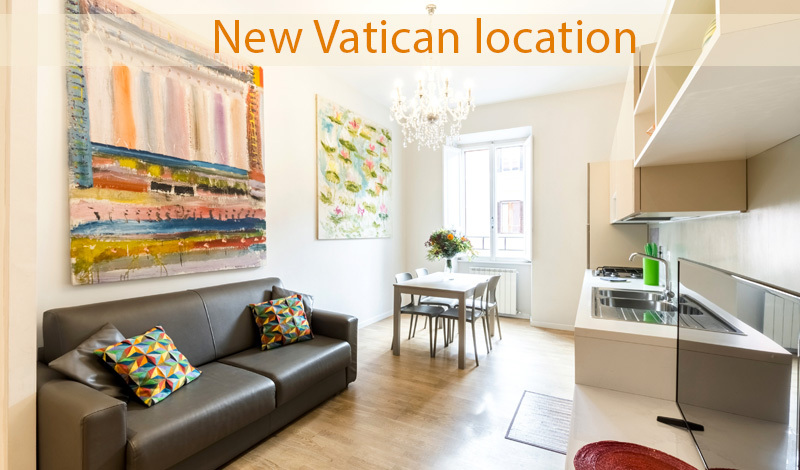 The apartment Suite Vaticano consists of three bedrooms, two bathrooms and a living room with a kitchen. Thanks to its three bedrooms (both double and triple) and its living room equipped with a comfortable and practical sofa bed, the apartment can host up to ten people. 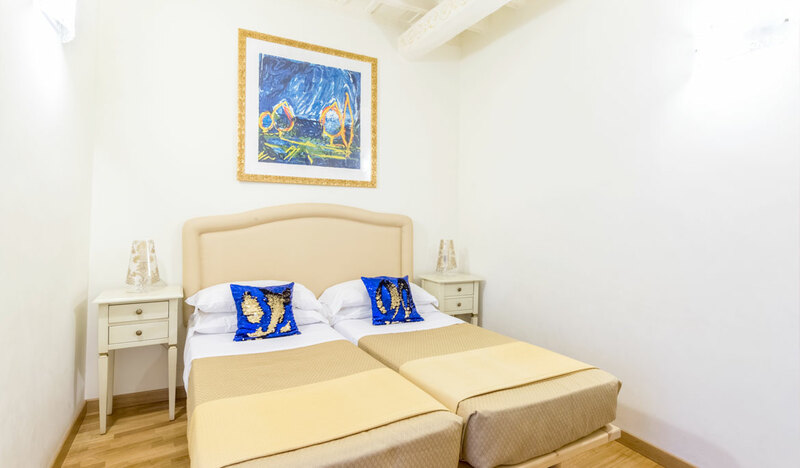 Situated in the historical center of Rome, the location is great for exploring by foot the Vatican, Piazza Navona, Pantheon, Trevi Fountain; we are one step away from Piazza Campo de' Fiori, and within walking distance to the Roman Forum and the Coliseum. Walking along the historical Via Giulia, located behind our apartments, and crossing the picturesque Ponte Sisto you will even arrive by foot to Trastevere. We offer our guests our personal experience in the field of tourism, as we are ready to offer help and advices for planning the best tour of the city, both before arrival and during the stay itself. We work with passion and sense of responsibility, we like meeting new people from all corners of the world and try to make their stay in Rome as pleasant and easy as possible. Having a home in the historic center of Rome means to be part of History itself. For this reason, we tried to preserve the historical and architectural features of the house to give our guests a stay with a meaningful and authentic taste as the style of an ancient city like Rome. 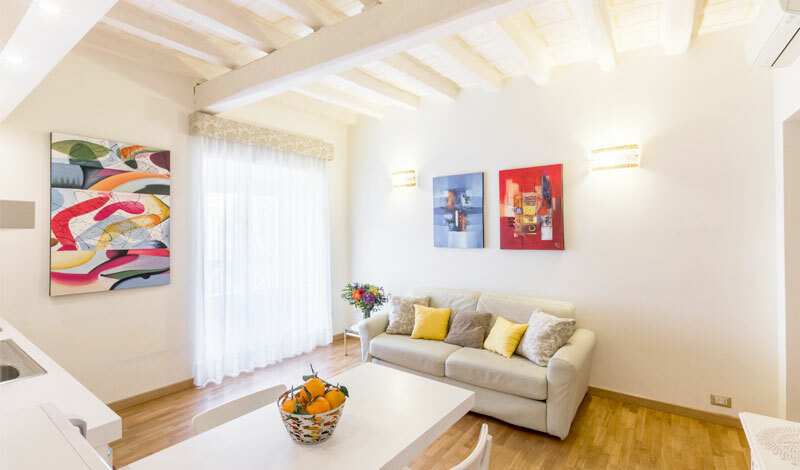 In our apartments, along as with the comfort of a modern house, you will find decorated beamed ceilings, original doors, antiques and wooden floors in every room. If you travel with your computer or smartphone always connected to internet, you will appreciate to surf for free the web via Wi-Fi and to stay in touch with your family and friends. At the check-in in our apartments we will give you the password to connect your devices within seconds. 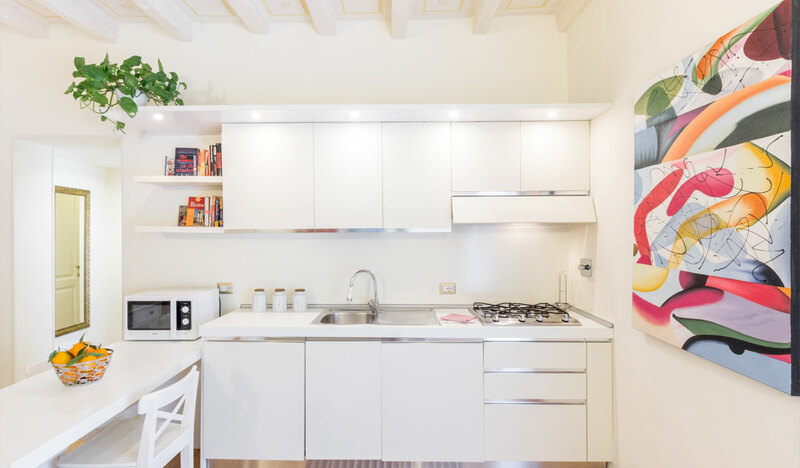 The ideal home for your vacation in Italy can be found in the heart of ancient Rome, only a few steps away from Piazza Navona, Pantheon, Campo de' Fiori, Castel Sant'Angelo, and Piazza S.Pietro. 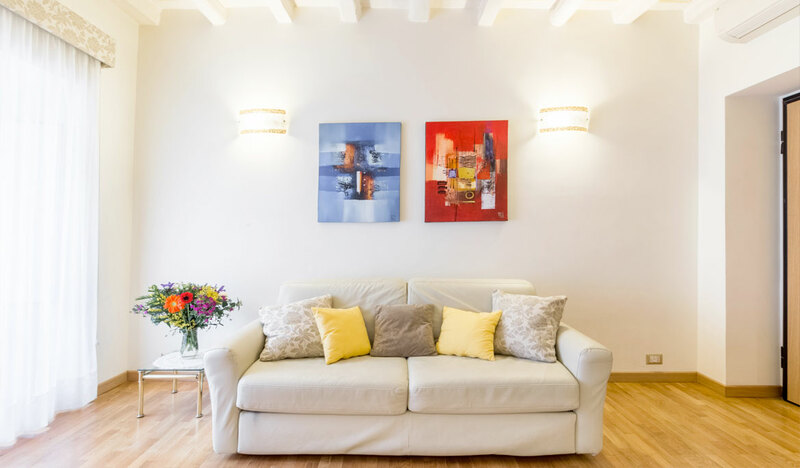 In this perfect location, rich with art and history, you may choose from two apartments, both fully furnished and elegant, providing the comfort and feel of a true home. The apartments are located on a typical street of the historical center. The monuments of Baroque and Renaissance Rome will be your neighbors, peculiar views will capture your attention through the narrow cobblestone streets lined with workshops, elegant antique shops, and local restaurants. 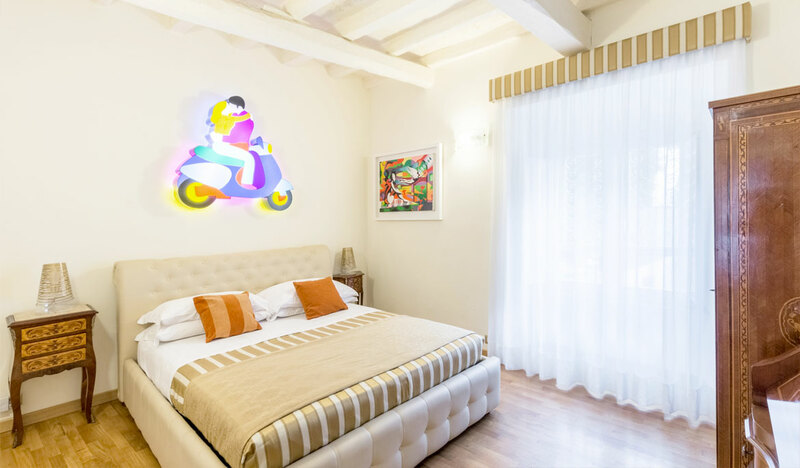 You will also be able to appreciate the relaxed and convivial Roman night life that you will encounter only a few steps from home, between Piazza Campo de' Fiori and the popular Trastevere district. This central location allows easy movement by foot to all the major sites of historical and artistic interest of the city. The area is also well served by numerous bus routes, if needed. All the services you need while on vacation, such as banks, post office, pharmacy and supermarket, are close on Corso Vittorio Emanuele II. Additionally, if you love sports, the gardens of Castel Sant'Angelo are an ideal place to go jogging in the morning. We offer our guests our personal experience in the field of tourism, as we are ready to offer help and advices for planning the best tour of the city, both before arrival and during the stay itself. Cookies help us provide our services , using these services you consent to the cookies from us.